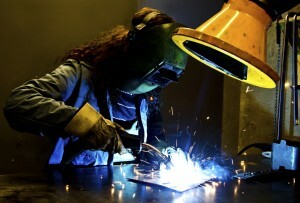 There Are Many Types Types of Welding. We Do It All! Stick Welding (or Shielded Metal Arc Welding), is the most common type of welding. Unlike other types of gas-shielded welding, stick welding is nearly impervious to drafts and other environmental conditions. The electrode heats up and liquefies small amounts of “flux,” which is like liquid metal glue. The flux is applied to the joint and creates the bond joining the two pieces. This technique is the most versatile because it works in any position, whether the welding is happening flat, vertical, or even overhead. MIG Welding (Metal Inert Gas) involves a “gun” which melts steel wire, which is fed into the gun from a machine into the contact tip. The wire melts at the tip of the gun, which is electrically charged, to create the welding liquid. This type of welding is done either indoors, or with plastic sheets to shield the work area from wind. MIG works with steel, stainless steel, and aluminum, and is not particular about position. 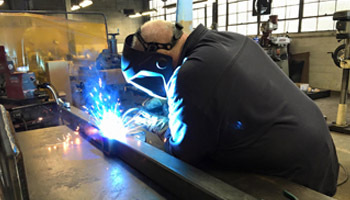 TIG Welding (Tungsten Inert Gas) works with a wider variety of metals, and the argon gas used protects the weld from contamination without producing toxic smoke, fumes, or slag, making it a “clean” technique, and good for indoor work areas. TIG Welding requires high levels of skill and years of experience to do it right. Welding Services – Detroit Wrecker is not just a mechanic repair station. We are a full-service machine and fabrication facility, with state of the art technology and highly skilled artisans. Whatever kind of welding you need done, we are happy to help you out. Got an idea for a prototype design invention? We can build it for you! Come on down with your blueprints, plans, diagrams, whatever! We charge a flat hourly rate for welding and fabrication mock-ups, so you can have it your way. We even Weld cylinders. Tow Truck Repair – Obviously, if it’s a tow truck, we can work on it. If your truck has a hole in the aluminum bed, or if your steel bed has spots that are rusted out, our fabrication team will surgically remove the affected area and rebuild. Don’t give it another minute’s headache! Just come on down and let our experts replace, rebuild, refurbish or modify whatever your truck needs. Mechanical Welding – Whether it moves or not, our guys can repair it, reinforce it or rebuild it. Whatever your metalworking needs, let the highly skilled craftsmen in our shop take care of it for you. If you have industrial machinery, construction equipment, a tow truck or a metal workbench that needs repaired, come to Detroit Wrecker for world class service.